Plan to stay at home for a whole day... to sleep and rest.. I've caught w/ a flu and sore throat.. and overworked... I'm really sick now! Haven't visited doctor yet... just bought flu and cough medicine from the pharmacy.. dunno how effective those medicines are..
Btw, nowadays all the prices have increased. Oil, food, drink, and everything! Yesterday I heard the news saying that the health supplements prices have also increased, included Chinese medicines... Haiz... everything increases.. except the salary, of course! The weather has changed drastically from super hot to super heavy rain and it explains on how lots of people getting sick nowadays.... Haizzzzz..... crazy world!!! This morning, when I was on the way to office, inside the MRT, half way to Dobhy Ghaut, I couldn't continue reading the mypaper. I felt myself of getting giddy, like what I used to feel. I tried my best to hang on, at least until I reach the Dobhy Ghaut. The seat in front of me were occupied and noone seemed to get up 'til I went out. I went down to buy a hot soya milk, the nearest shop I could see and no other thing appears on my mind. Wah.. really hard only to walk for few steps.. Took few sips to get more energy but the cramps were still there.. so I went to the toilet once again. Then went up again to take a seat.. then slowly walked to the bus stop and took the bus to the place where the company's clinic located. Lucky there was one direct bus so that I needn't walk too much. I waited quite some time before my turn. Oklah.. write 'til here.. Need more rest... have a nice day everyone! Don't get sick like me, OK? Take care!!! We sang and drank until 1.25am. Suli and Lam still continued singing 'til 1.40am. Wah, we were all so tired already and we still had to work on Friday... Luckily all of us managed to go back work the day after without getting late at all... On Friday, Lam brought his camera to office and we took some pictures together. He said he would bring the CD later on, when he came to collect his checque. But I'm happy for my 2 colleagues who have been winning 4D & TOTO for the past 1 week!!! First, it was L winning a thousand bucks from 4D, then S won 90 dollar from TOTO, and this morning, both of them won total of 2.5k from 4D!!! Wow!!! 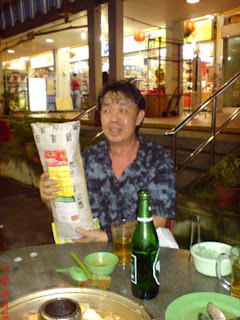 This Thursday we will have a steamboat at AMK, at the same time a farewell dinner for L. Friday will be his last day ='( He has found a better job than this one. Anyway... they're lucky, I'm lucky too... can save some money from breakfast, lunch and dinner... hehehe.. Thanks guys!!! So sleepy now... Going to sleep soon ah.... Have a great evening!